Get Quetta Gladiators Team Kit, Logo and Official Song for PSL 2019. Pakistan Super League 2019 is being held from 14th February in U.A.E and Pakistan. A total of six teams will participate in it. Quetta Gladiators represent Quetta city which is the capital city of Baluchistan. Quetta Gladiators Team Kit, Logo and official Song is available here. Quetta Gladiators have been a bit unlucky side in Pakistan Super League all seasons. Despite competing in two of the PSL finals, they could not win the title. However, this year, Quetta Gladiators will appear in the PSL with new hopes to claim the title. 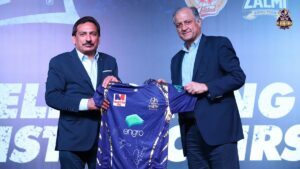 The Quetta Gladiators team management has announced the Team kit, Logo and official song for the Quetta Gladiators in the PSL 2019. The official team kit for Quetta Gladiators in PSL 2019 is in purple colors. The official logo of Quetta Gladiators is printed on the left side of the shirt. Whereas, Master Oil Logo which is an oil company in Pakistan, is placed on the right side of the kit. Whereas, the Engro Pakistan logo, which is a leading fertilizers company in Pakistan is place o the bottom side of the kit. The official log for Quetta Gladiators in PSL 2019 is in purple color. Its a Gladiators cap with two bats on its right and left side. 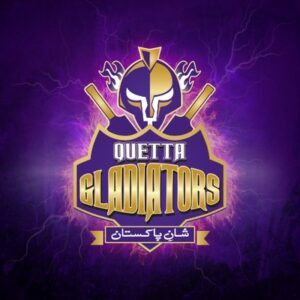 Moreover, Quetta Gladiators name is too printed on the bottom of this logo. The official song for Quetta Gladiators in PSL 2019 is “Jee ba tara quetta”. Umar Akmal, Shane Watson, Rilee Rossouw, Mohammad Nawaz, Anwar Ali, Saud Shakeel, Sunil Narine, Sohail Tanvir, Dwayne Bravo, Fawad Ahmed, Mohammad Asghar, Danish Aziz, Ahsan Ali, Ghulam Mudassar, Mohammad Hasnain, Sarfaraz Ahmed(c), Harry Gurney, Ahmed Shehzad, Dwayne Smith, Azam Khan, Jalat Khan, Mohammad Irfan Jnr.